Today, we’re featuring a classic French cocktail — the Kir. The Kir is traditionally served before a meal during an apéritif. It can also be served during any cocktail hour. It is basically a mix of crème de cassis (i.e. sweet liqueur made from blackcurrants) and white wine, typically a dry Burgundy. The Kir is named after Félix Kir (1876–1968), a famous catholic priest, WWII French resistance activist, and mayor of Dijon in Burgundy, France. After World War II, Félix Kir popularized the famous regional drink “blanc-cassis” (a white wine with blackcurrants liqueur drink) all over France and Europe. He would have blanc-cassis served at all official gatherings and soon enough, the Kir was a popular drink outside Burgundy and was renamed “Kir.” The original Kir calls for 1/3 crème de cassis and 2/3 Burgundy aligote (Bourgogne aligoté) which is very sweet and strong. 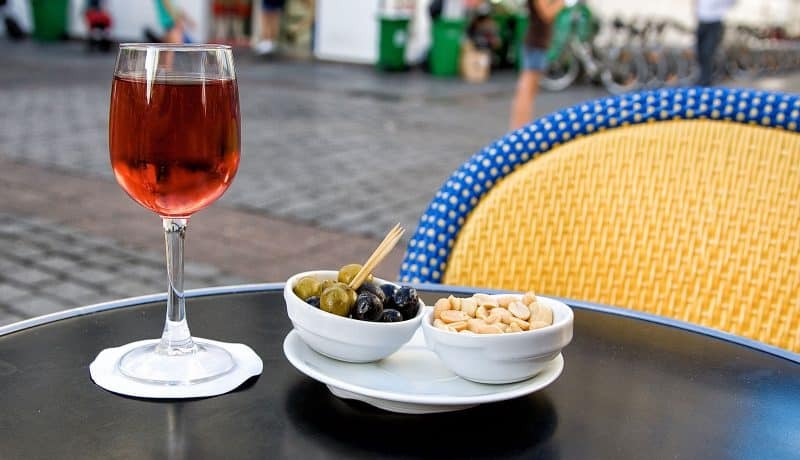 Now, most Kir served in France have a higher ratio of white wine. It is typically 9 parts to 2 parts but it varies based on how sweet a guest likes his or her Kir. A Kir is a simple refreshing drink sure to please your guests. For special occasions, bring out the champagne glasses, replace the white wine with Champagne and you just made Kir Royal! Check our detailed recipe and Art of the Home suggestions below. Enjoy in moderation! Pour crème de cassis in individual glasses. If needed, you may prefer to gently mix with a small spoon before serving. Glassware: Kir is typically served in a wine glass although it can also but served in a Champagne flute. Kir Royal is always served in a Champagne flute. Make sure you tilt the flute when you serve to minimize Champagne bubbles. Dosage: 2 cl is about 4 tsp but keep in mind that the dosage does not need to be exact, it’s an art more than a science. You can simply look at the glass and estimate a 2 to 9 parts ratio. You can also judge based on color (see picture above) or taste (and adjust accordingly the next time).